Whether you or a family member is on a gluten-free diet, finding a gluten-free bread that doesn’t taste like cardboard can be a challenge. A store-bought loaf of gluten-free bread with good flavor, texture, and appearance, that no one will know is gluten-free, sounds too good to be true, right? Well, not anymore. Udi's Gluten-Free Foods in Denver, Colorado, has found a way to achieve this formerly unattainable goal in their gluten-free multigrain bread. 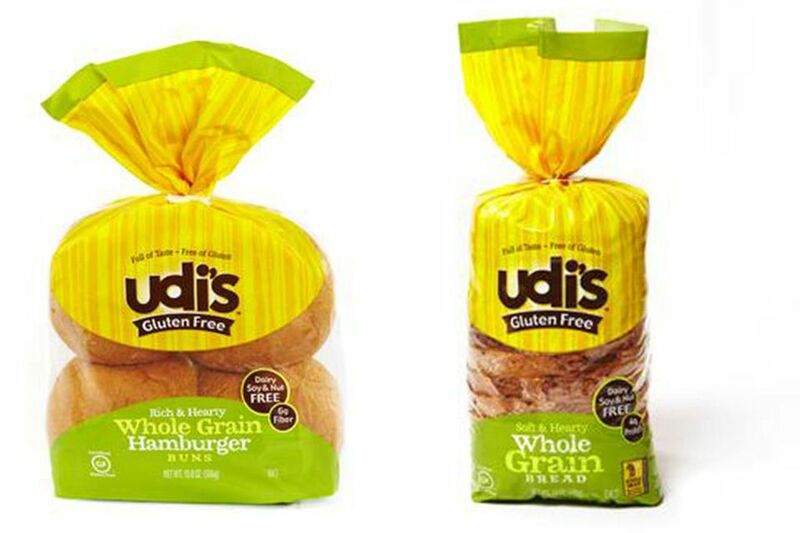 Udi's gluten-free products include a wide range of baked products, from white bread to bagels, blueberry muffins to pizza crust, and English muffins to hamburger buns. If you can't find Udi's gluten-free products in your area, they are available online through Udi's website. For longer shelf life, keep Udi's products in the freezer until ready to eat. Each 12-ounce package contains approximately 14 slices of bread; one serving size is 2 slices of bread. This really is the best tasting, best textured gluten-free bread on the market, bar none. It has a "fresh from the bakery" flavor and is soft enough to eat as is, but is also equally delicious when toasted. Tasting so similar to regular multigrain bread, Udi's gluten-free may fool those without gluten allergies. This bread is dairy-free, nut-free, and soy-free, making it ideal for people with multiple food allergies and/or intolerances. It is important to note that this bread does contain egg whites, however. If this bread wasn’t as good as it is, you may not be willing to pay the cost; the average price for a 12-ounce frozen loaf is $6, about double the cost of a regular loaf of commercially produced sliced bread. However, this is about what you will pay for almost any loaf of gluten-free bread, so knowing this brand is one of the best you can feel you are getting your money's worth. At first glance, the smallish size of the loaf may surprise you, and if you have to feed a family with growing kids that love toast and sandwiches, the price may be concerning—or deter you from buying it altogether. It is only 7 servings a package, and small servings at that. So if you have a household of big eaters, be prepared to purchase a few loaves at a time. Udi’s gluten-free whole grain bread may also be a little tricky to find. It is not in the bread aisle, but instead in the freezer case. This is because gluten-free products have a shorter shelf life compared to those made with wheat flours; gluten helps retain moisture in a baked good so a bread without gluten can get stale much quicker. Because gluten performs a number of functions in bread dough—such as binding, elasticity, structure, and moisture retention—when it isn’t present there needs to be replacement ingredients that will mimic these functions. Therefore, the ingredient list for gluten-free baked goods will contain some that may be unexpected. However, there are also ingredients that are found in regular bread, so don’t be alarmed by the several multi-syllabic words that you may have never heard of. For example, Udi’s uses an array of dough conditioners, including calcium sulfate, monocalcium phosphate, cultured dextrose, ascorbic acid, microcrystalline cellulose, and enzymes. Dough conditioners are used by virtually all commercial bakeries to create an environment within the dough that yeast thrives in. Dough conditioners make baked goods lighter with better crumb texture and can retard staling. Otherwise, the ingredient list includes tapioca starch, brown rice flour, teff flour, flax seed meal, and potato starch to replace the regular wheat flour. It also contains yeast, egg whites, and baking powder and soda to assist in leavening, and the xanthin gum is a common additive that helps in binding ingredients together. Also on the list are canola oil, sugar, apple cider vinegar, salt, and cornstarch. A serving (2 slices) of Udi’s gluten-free multigrain bread is 140 calories, 4 1/2 g total fat, 0 saturated/trans fat, 0 cholesterol, 24 g carbs, 3 g sugar, 1 g fiber, and 2 g protein.